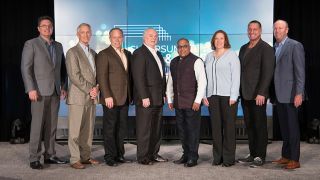 The 2018 PSNI board of directors PSNI Global Alliance made its 2018 board of directors official during the organization’s annual Supersummit. The 2018 board will include a combination of North American and global members to reflect the goals and opportunities identified by the executive leadership team for the alliance. The new board includes the two-year appointment of Jeff Irvin, principal at Spinitar, and former vice president of the PSNI board of directors. Irvin will replace Dana Barron as president while Barron will act as past president for the board. “After serving on the board over the past three years, I’m very excited and honored to now serve as president of PSNI Global Alliance during such an extraordinary time in our association’s history,” Irvin said. “Now that the PSNI Global Alliance is being poised to serve customers in major markets throughout the world, the opportunities for PSNI affiliates and our preferred vendor partners are immense. I look very forward to leading the continuing transition of PSNI into a global organization, as we build better work and learning experiences and outcomes for our customers wherever they may be. Additionally, three global members-at-large have been added to the lineup in order to provide international input and experience while acting as a voice for the global organization. A two-part election was conducted this year. The first was held during the PSNI Global Alliance meeting held in Rotterdam, Netherlands, where the global members selected three representatives to the PSNI board of directors. At the North American annual meeting held prior to Supersummit ’18, the stockholders elected the four officers bringing the total number to seven that reside on the PSNI Global Alliance board of directors.